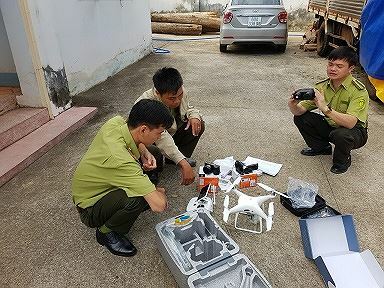 The Forest Protection Department of Dong Nai Province has distributed new equipment to the forest rangers on January 29 in Dinh Quan District to prevent rampaging elephants. The forest rangers were given a flycam, a camera, binoculars and other equipment to work in the forest. Nguyen Van Chieu, vice head of Dinh Quan Forest Protection Department, said the new flycam and binoculars would help the rangers monitor the wild elephants and develop suitable plans to protect local property as well as the elephants. Thanh Son Commune has 14 elephants that often go in two to three groups to the outskirts of the forest, where there is no electric fence, to search for food. The damage is huge since this is also banana, mango and cassava harvest time. The elephants have gone on 11 rampages and caused severe damage to the crops of the residents in Hamlet 5 since January 1.